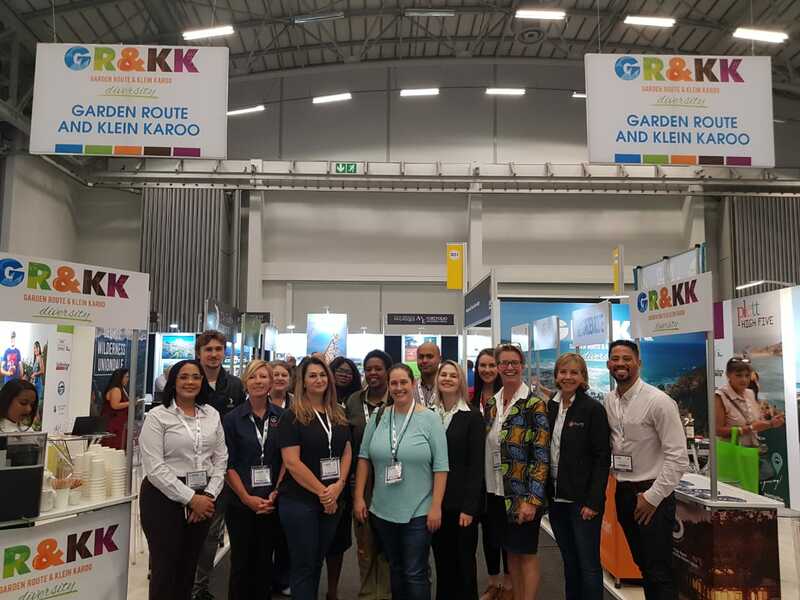 Garden Route and Klein Karoo Regional Tourism Office is currently exhibiting at the World Travel Market Africa show in Cape Town. The Regional Tourism Office is exhibiting on stands P24 and Q23, together with the Local Tourism Offices: Plett Tourism, George Tourism, Oudtshoorn Tourism, Hessequa Tourism and Calitzdorp Tourism. 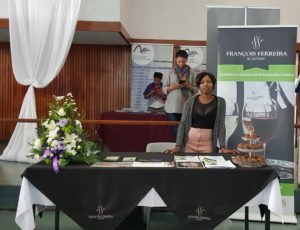 The following products are also exhibiting on the stands, namely: De Rusta Estates, Redberry Farm, Oubaai Hotel Golf and Spa, Destination Garden Route, Gourikwa Reserve, the Knysna River Club, Hog Hollow Trails and the Ocean Sailing Charters. 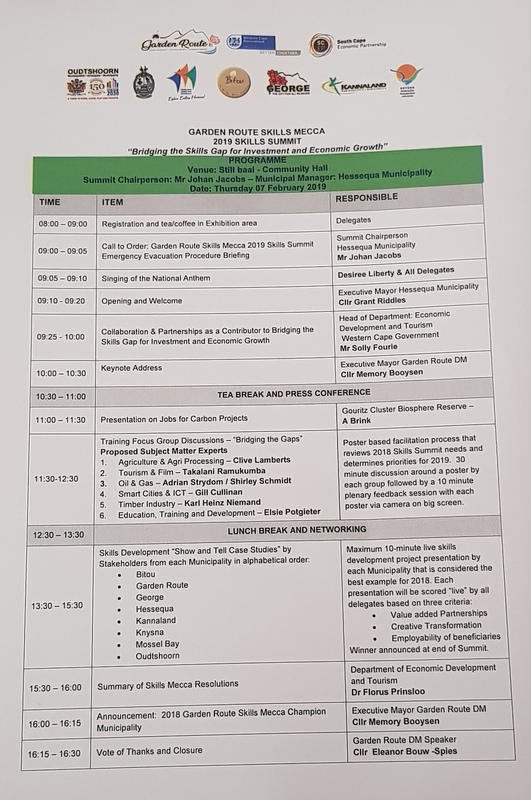 On Tuesday, 26 March 2019, the National Department of Public Works in collaboration with the Provincial Department of Public Works and Transport held an Expanded Public Works Programme (EPWP) grant allocation workshop. EPWP officials from all seven b-municipalities in the Garden Route and Central Karoo districts attended the event. The objective of the engagement was to inform municipalities about the methodology utilised for the 2019/20 allocation of grants as per the Discover, Offer, Request, Acknowledge (DORA) framework. The conditions of grants were presented to workshop attendees. During the insightful and interactive working session, municipalities reflected on their 2018/19 Integrated Grant Performances, EPWP Phase III performance reports and the targets and expansion areas for the EPWP Phase IV. The different municipalities’ spending performance were highlighted, challenges experienced during the past phase discussed and general concerns and suggestions shared. 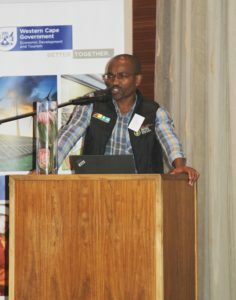 Garden Route DM EPWP Manager, Mr Richard Dyantji during the workshop. One of the key concerns raised by officials during the sessions was that it has not been feasible to provide training to all the big numbers of EPWP participants due to limited funding. It was agreed that targets set by public bodies were unrealistic and many public bodies did not have the capacity to implement and report EPWP projects, and it was suggested that the targets should be linked to grant allocations provided by the national department. Mr Richard Dyantyi also raised concerns that district municipality does not receive a Municipal Infrastructure Grant (MIG) which hampers them to meet their targets in terms of work opportunities and FTE (Full Time Equivalent), as outlined in the protocol agreement. During a robust discussion by representatives of all three spheres of government, it arose that the EPWP Phase IV process will come-up with strategies to address most of these challenges. According to Ms Lindiwe Kuna from the National Expanded Public Works Programme, EPWP does not have a national formal policy in place – a need to formulate a policy will be prioritised. According to Ms Kuna, the 1st phase of the policy formulation process started last year, 2018, after a consultant was appointed. “Today, we are here to continue with the process and start with phase 2, whereby we give an opportunity to EPWP representatives to also provide input to be considered for incorporation into the policy,” she said. 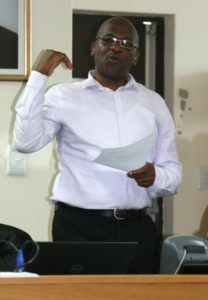 Mr Mzimkulu Gusha, Programme Manager at the National Department of Public Works facilitated the programme. The audience then formed plenary session, after which each group had to discuss and present their feedback to the entire audience at the event. 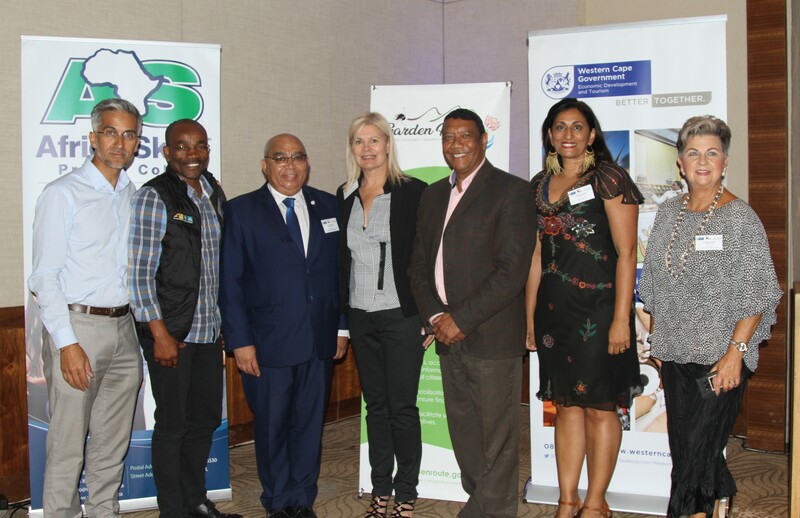 The Minister of Economic Opportunities, Ms Beverley Schäfer and the Minister of Social Development, Mr Albert Fritz, visited George to launch the first ever, ‘’Youth on the Move: Gateway to Opportunities” programme on 4 and 5 March 2019. 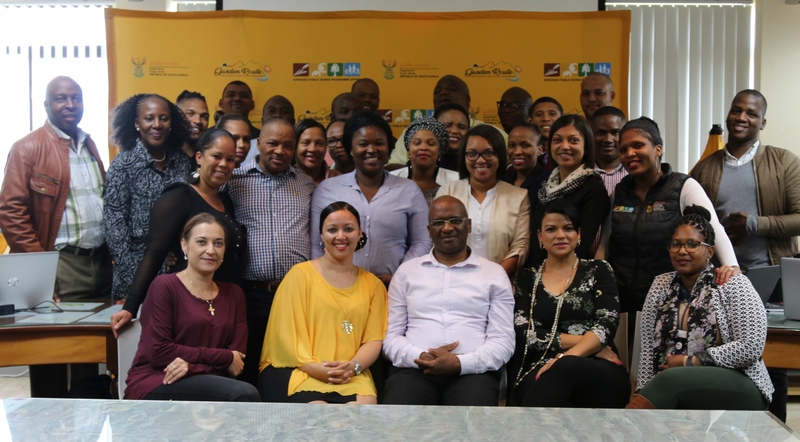 This two-day pilot youth initiative was hosted by the Western Cape Government in collaboration with the Garden Route District Municipality (GRDM), George Municipality and the Garden Route Skills Mecca steering committee. 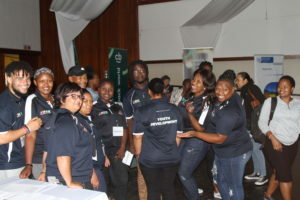 The “Youth on the Move” programme is a step towards achieving the commitment made by Minister Schäfer to create 250 000 new job opportunities Local Government level, and aimed at connecting youth who are looking for opportunities with employers and organisations. GRDM Executive Mayor, Cllr Memory Booysen during his keynote address about the Garden Route Skills Mecca and Skill Summit Resolutions. On Monday, 4 March 2019, Minister Schäfer and her delegation met with the executive mayors of the GRDM and George Municipality, representatives of the local business chambers, potential employers, educational institutions and local stakeholder groups working with the youth. 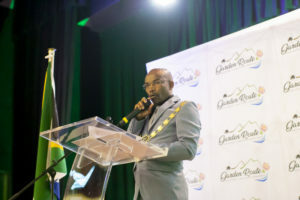 During this jam-packed gathering, the GRDM Mayor, Cllr Memory Booysen, explained the district’s vision of becoming a skills mecca, not only for those residing in the Garden Route or Western Cape Province, but for the entire South Africa. He enlightened the audience about last year’s Investment Conference and the two Skill Summits hosted by GRDM as well as the resolutions taken and spearheaded by the GRDM. Mayor Booysen continued by saying: “In order for people to invest in our region, we need to have the relevant skills to drive investment and because of this, the GRDM took a conscious decision to up-skill our people in the district. Today I am here to declare that we are ready for business, we are committed and with the limited funds that we have, we want to drastically lower unemployment, up-skill the youth, and do whatever is necessary for this district to be one of the best”. On Tuesday, 5 March 2019, Minister Schäfer met with over 200 unemployed young people from the region. During the event, youth were placed into various working groups where they answered questions about barriers faced when trying to access opportunities. The youth also shared their views on how technology is used nowadays to advance skills and opportunities, and how they go about finding work and opportunities. During her keynote address, Minister Schäfer said: “Too many young people in South Africa do not have access to opportunities. Our job as government is to open the gateway between employers and young people looking for jobs. You need to walk through that gateway and get that first job. Once you’ve got that first job, you’ve got the experience to put on your CV, which allows you to show that you’ve got skills,” she said. In conclusion Minister Schäfer said: “Over the past two days we’ve heard from employers that they’re not finding the best people with the right skills and we’ve heard from young people that transport, safety and the cost of printing out a CV, are some of the barriers that they’re experiencing. 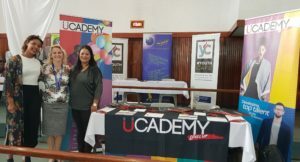 By growing digital skills in our province, and encouraging youth to use technology like online job searches, apps and to make use of services like youth cafés and the ICAN Learn programmes, we can start to make headway in addressing the concerns expressed by both employers and the youth,” she said. George Municipality’s Youth Development Officers who assisted with the ‘peace-keeping’’ and logistic arrangement during the 2day event. Subject to the outcomes of the initiative, the “Youth on the Move” programme will be adjusted and progressively rolled out across the Western Cape Province with an event scheduled every three months as district and local municipalities come on board. 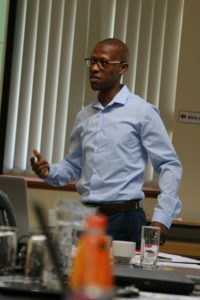 Through this project, the Western Cape Government together with the district- and local municipalities in the Garden Route strive to create a pathway for unemployed youth to access opportunities, to match the demand of employers for suitable qualified persons in the district and in that way sustain industries and support economic growth within the district and Western Cape. The Garden Route District Municipality (GRDM) is committed to investigating adaptive climate change initiatives and successes. It is for this reason that the climate change team late last year visited the Berg-en-Dal Farm in Ladismith, which is the home of the Klein Karoo Sustainable Dry lands Permaculture Project (KKSDPP), founded in 1999. During the visit, the municipality’s climate change team was taken on an interactive and eye opening tour by Ms Alex Kruger, who passionately explained each step of their many diverse examples of sustainable climate change adaptation and mitigation examples. The KKSDPP provides a dynamic training environment on the concept of permaculture and its positive impacts on environmental sustainability within an uncertain future. The project team is providing working examples of a wide range of natural building approaches, waste and water recycling, sustainable energy generation and food production, amongst others, to illustrate climate change adaptation and mitigation as part of a sensitive yet dynamic socio-ecological system. The severe and disastrous impacts of climate change calls for Municipalities to think differently about adaptation. Climate change is no longer a hypothetical future possibility, but an inescapable fact of everyday life. As climatologists become more certain about human effects on global atmospheric composition and their consequences, extreme weather events become ever more common and slower trends such as sea level rises and changes in seasonal weather patterns continue. The most recent summary report of the Intergovernmental Panel on Climate Change reaches some stark conclusions. It predicts, with high levels of certainty, continued rises in global mean surface temperatures if greenhouse gas emissions are not abated, and alongside this, greater and more frequent extremes of heat, global increases in precipitation, and continued loss of Arctic sea ice. It also suggests that continued changes in many aspects of global climate systems are likely even if temperatures stabilise, and raises the possibility of abrupt shifts in some of these. As our understanding of the significance of climate change deepens, the view that responses will involve a transformation in human relationships with nature becomes increasingly widespread. It is an invitation to re-assess humanity’s place in the world, and to transform global society in ways that allow our continued survival. The concept of permaculture originated in just such a re-assessment, and has become a significant impetus for such a transformation. Permaculture is the conscious design of human living environments that are reflections of the ecological principle that underlies nature. It includes a diversity of concepts, knowledge, strategies, tools, techniques and practices that are reshaping the world and providing compelling visions of what is possible. The permaculture principles are clear examples of how we can restructure, regenerate, restore, and renew, as part of the necessary tools for climate change adaptation and disaster risk reduction. The KKSDPP is offering a wide diversity of services, courses, events and consultations to the public. They form a dynamic component of a network of permaculture and alternative living practitioners and organisations that spans the globe. The Garden Route District municipality appreciated this new and refreshing view of climate change adaptation – one that is exciting, inspiring, and engaging, and one that calls on us to step up to the adaptive challenge of climate change adaptation. For more information on the KKSDPP or their various courses and initiatives on offer, please contact Ms Alex Kruger at kruger.alex@gmail.com or 072 241 1514. 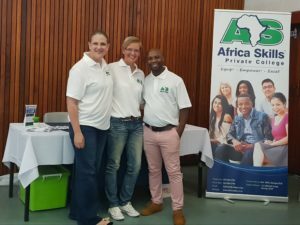 The South African Institute of Environmental Health (SAIEH) in partnership with the Swiss Embassy, South African Local Government Association (SALGA), Department of Agriculture (Veterinary Service) and the City of Cape Town hosted the 21st National Conference in Environmental Health, at the City of Cape Town council chambers from 16-19 November 2018. The theme of the conference “One Health – An Environmental Health Perspective”, aimed to demonstrate an integrative effort of multiple disciplines working locally, nationally and globally to attain optimal health for people, animals and the environment. A proud Executive Manager of the GRDM Community Services with his research team and the Portfolio Councillor. Fltr: Ms Maxwelline Fatuse, Mr Gcobani Tshozi, Ms Jessica Erasmus, Ms Heidi Cronje, Ms Sive Mkuta, Mr Clive Africa (Executive Manager), Ms Wandile Magwaza, Mr Lusizo Kwetshube, Cllr Khayalethu Lose (Portfolio Chairperson), Ms Ivy Mamegwa and Ms Emmy Douglas. 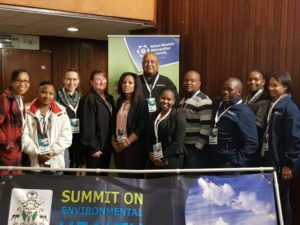 The Garden Route District Municipality’s (GRDM) Executive Manager of Community Services, Mr Clive Africa attended the 4 (four) day conference, accompanied by his leading team of professionals within the field of Environmental Health. 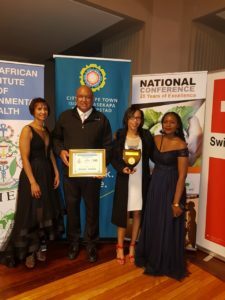 The GRDM Municipal Health Services (MHS) submitted nominations for the Best Municipality and Best Environmental Health Practitioner (EHP) awards. The Municipal Health App Project has been nominated for this Award. The Municipality has been awarded as one out of three municipalities, with the Best Environmental Health Project. Since the implementation of the Municipal Health App, the GRDM Environmental Health Practitioners experience a lot of benefits in conducting their daily inspections. The App assists EHPs to capture information electronically on site, without writing reports afterwards. This method assists them to do more inspections and be more productive while they are out in the field and interventions can then be executed immediately. This method also enables EHPs to do more inspections and save more lives. The GRDM resolved and implemented paperless council meeting agendas a few months ago in their effort to go green to save the planet. Garden Route DM delegates with the awards received during the gala event. The GRDM Executive Mayor, Cllr Memory Booysen with the EHPs who delivered presentations on day 2 of the conference. Ms Emmy Douglas who also acted as research supervisor and project leader, did a sterling job in coaching EHPs in delivering a quality research project and research presentations. On Monday, a field trip was undertaken by delegates to the Goodwood Disaster Centre and the Swiss Housing project in Khayalitsha. The last item on the program was the compilation and discussion of resolutions that were taken during the conference. One of the resolutions taken was to approach the National Health Laboratories and discuss their service delivery to the public. The possibility of establishing an accredited laboratory in South Africa, as most of the critical scientific testing can only be done overseas at a very costly price was also raised at the conference. Results for these complex tests also take a long time which could negatively influence the health of our communities. Vector control is an important component of many disease control programmes. It is a cornerstone of very effective campaigns to control vector-borne diseases. For a number of diseases where there is no effective treatment or cure, such as West Nile Virus and Dengue Fever (not endemic to the Garden Route), vector control remains the only way to protect populations. Vector control is any method to limit or eradicate the mammals, birds, insects or other blood-feeding arthropods, collectively called vectors, which transmit disease pathogens. Mosquitoes are the best-known invertebrate vector and it transmits a wide range of tropical diseases, including Malaria, Dengue and Yellow fever. Another large group of vectors is flies. However, even for vector-borne diseases with effective applications, the high cost of treatment remains a huge barrier to a large number of developing countries. Vector-borne diseases are transmitted by the bite of infected arthropod species, such as mosquitoes, ticks, bugs and sand flies. Despite being treatable, malaria, which is transmitted by mosquitos in Africa, has by far the greatest impact on human health. A child in Africa dies of malaria every minute, although vector control measures that have been in effect since 2000, reduced fatalities with 50%. As the impact of diseases and viruses are devastating, the need to control the vectors in which the disease or viruses are carried, continues to be prioritised. Vector control in many developing countries can have tremendous effects on mortality rates, especially among infants. 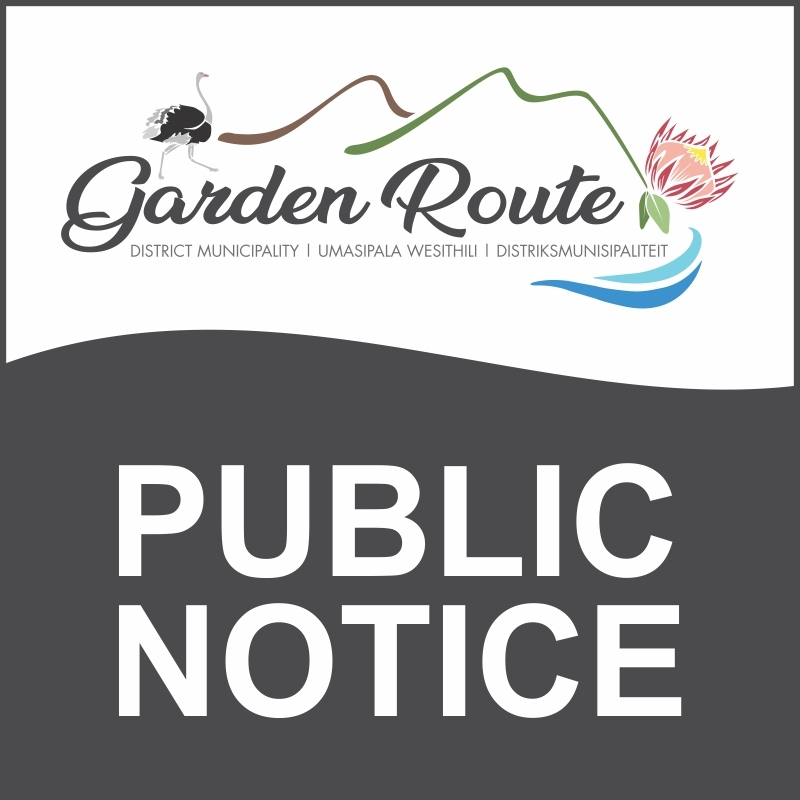 The high movement of populations causes diseases to spread rapidly – the Garden Route District cannot be excluded from this migration trend. Remove or reduce areas where vectors can easily breed. This will limit their growth, for example, the removal of stagnant water, riddance of old tyres and cans that serves as mosquito breeding environments. Limit exposure to insects or animals that are known disease vectors can reduce infection risks significantly, for example, window screens or protective clothes can help reduce the likelihood of contact with vectors. Chemical control by using insecticides, rodenticides or repellents to control vectors. Biological control, the use of natural vector predators such as bacterial toxins or botanical compounds can help control vector populations, for example, using of fish that eat the mosquito larvae. Prevent vectors by wearing light coloured, long sleeved shirts and long pants, tucked into socks or boots. Use repellent on exposed skin and clothing, to protect yourself from being bitten by mosquitos, sand flies or ticks. Simple hygiene measures can reduce or prevent the spread of many diseases. Before travelling, vaccinate against diseases prevalent at your destination for example, Yellow fever. Antimalarial medicines is also available. Use window screens to control mosquitoes. Sleep under an insecticide-treated bed net, if in a place or area with a malaria risk. Check your body regularly for ticks. If you find one, remove it with a tweezers and apply a skin disinfectant. In a tick- infested area, check your clothing, luggage and other belongings. Avoid contact with blood, secretions, organs or other bodily fluids of infected people or animals. Make sure to keep strict hygiene control of food and avoid unpasteurised dairy products in areas where tick-borne diseases are prevalent. If bitten and did receive treatment abroad, please remember to complete your treatment course at home. If you become ill upon your return, tell your doctor where you have been, as you may have brought a disease back with you. Child care facilities should treat their sandpits with salt on a regular basis to prevent vectors. Rabies is a contagious and deadly viral disease, causing damage to the brain and the spinal cord. It affects both humans and animals, and in most cases, results in death once the disease symptoms develop. The rabies virus is found in the saliva and nervous tissue of infected animals. It is transmitted to humans and other animals through contact with the saliva or tissue of an infected animals; bites, scratches, licks on broken skin and mucous membranes. Once the symptoms of the disease develop, rabies becomes fatal to both humans and animals. Rabies symptoms may occur as early as one week and as late as several years after contact with, or bite from an infected animal. Seek treatment immediately after animal bite. Do not wait for symptoms to develop. What to do following a bite or contact with a suspected rabid animal? Contact your nearest state veterinarian, clinic or doctor. When should you suspect that an animal is infected with rabies? Suspect that an animal is infected with rabies when it shows behavioural changes such as restlessness, irritability, excitability and shyness. How do animals become infected? A domestic animal with injuries of unknown origin. Immediately isolate the suspected animal and inform your State Veterinarian. Have your dogs and cats vaccinated regularly (all pets three months or older must be vaccinated). Do not allow your pets to roam the streets. Rabies is a dangerous infection. Do not handle suspected animals. Report all suspected rabies cases to your nearest state veterinarian, animal health technician or to the police. What animals most often implicated in rabies transmission? Wild- mongoose, suricate mongoose, civet, small spotted genet, caracal, serval, lion, African wildcat, small-spotted cat, felid species, honey badger, striped polecat, striped weasel, black-backed jackal, bat-eared fox, wild dog, cape fox, aardwolf, brown hyena, ground squirrel, tree squirrel, greater cane cat, cape hyrax, Chakma baboon, warthog, impala, duiker, steenbok, kudu, eland, blesbok, bushbuck, reedbuck, springbuck, burchell’s zebra, herbivore species and scrub hare. Environmental Health Practitioners (EHPs) fulfil their responsibilities by working in accordance to the Constitution of the Republic of South Africa and the National Health Act. In conducting their day-to-day tasks, EHPs are responsible to render services in line with the nine (9) key performances areas of Municipal Health Services, which include: water quality monitoring, food safety management, waste management, health surveillance of premises, surveillance and prevention of communicable diseases, environmental pollution control, disposal of dead, chemical safety and vector control. 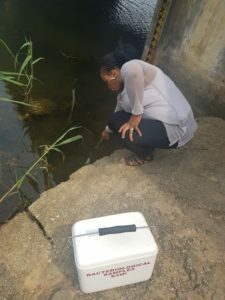 In the execution of the abovementioned and in ensuring that communities have the opportunity to live in an environment that is not harmful to their health and/or environment, the EHPs of the Garden Route District Municipality constantly perform Moore pad sampling in a quest to prevent the outbreak of the Cholera disease. Through this ongoing monitoring and assessments, these officials play a major role in the prevention of disease outbreak or sudden environmental health threats. 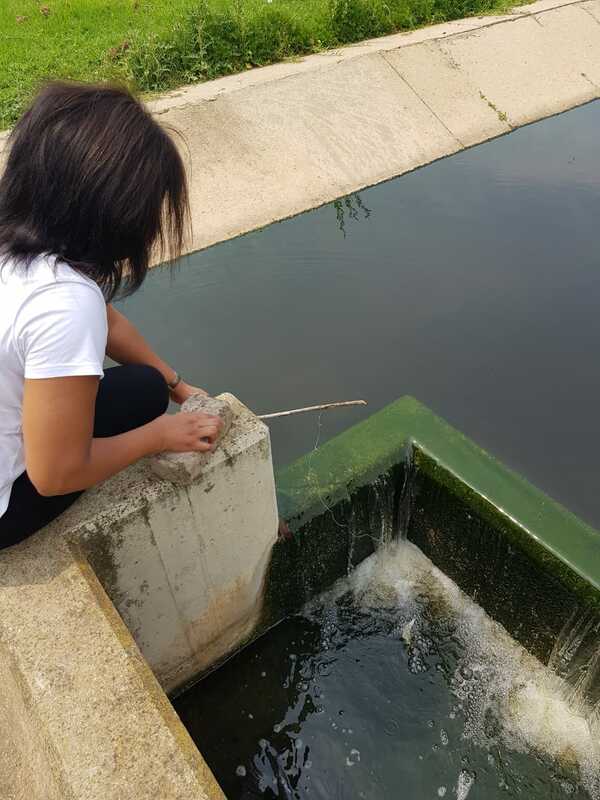 EHP, Ms Nokuphiwa Mbali, putting “Moore Pad” sample at Piesang River; one of the sampling points of Garden Route District Municipality. Cholera is an endemic disease, and the Vibrio Cholera bacteria is often found in the aquatic environment, where it can remain dormant for long periods of time as part of the normal flora of brackish water and river estuaries. It flares up under favourable conditions associated with algae blooms (plankton), which is influenced by the temperature of the water. Infected humans, who are temporary carriers, are one of the main reservoirs of the pathogenic form of Vibrio cholerae. Cholera is spread, as most other viral and bacterial diarrhoeal diseases, by contaminated water and food, i.e. the faecal-oral route. The ever-present role of flies and other vectors in the faecal-oral route must be kept in mind. Cholera is rarely transmitted by direct person-to-person contact. Place sterile surgical gauze swab tied with a length of 1 meter string into the flowing river or sewage so that the pad hangs below the surface of the water. This pad should remain in place for 72 hours, after which it should be pulled out, into a pre-prepared sterile bottle containing double strength alkaline peptone water. The labeled specimens must be sent to the laboratory at room temperature for analysis. The sampling rate is higher during season periods where water from the rivers and the lagoon are running into the ocean. Vibrio cholera bacteria is often found in the aquatic environment where it can remain dormant for long periods as part of the normal flora of salt water.